Ponteland's beat bobby has a new set of wheels to help him police the community – thanks to a grant from civic leaders. Ponteland Town Council and Darras Hall Estate Committee shared the cost of the £700 Giant Roam XR3 bike for Neighbourhood Beat Manager PC Paul Henery after hearing the benefits it could bring to tackling crime and anti-social behaviour. With numerous paths, parks and bridleways in the area, the bike gives PC Henery a speedy off road mode of transport when hunting or chasing criminals, as well as a highly visible presence to help address fear of crime. Town Mayor Robin Ramsay said: "The Council is keen to improve the quality of life for residents and businesses and this bike is another weapon our local police can use to tackle criminal activity. We thought it was an extremely worthwhile joint initiative we were more than happy to support." 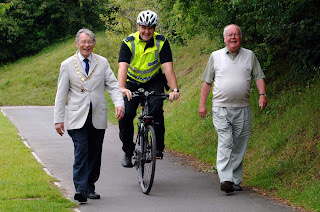 John Scott, Vice-Chairman of Darras Hall Estates Committee, added: "PC Henery made the point that there are places in Darras Hall he can get to quickly on a bike which are simply not accessible by car, including bridlepaths. It also gives us high visibility policing and we felt the bike was something he should have." PC Henery said: "I'm really grateful for the bike as it's going to make a difference to how I can patrol the area. I'll be able to provide a greater visible police presence in and around Ponteland and because I'm on a bike I can access hard-to-reach areas, such as the bridlepath, in order to tackle anti-social behaviour. I find that when I ride a bike I can talk to the public easily while patrolling Ponteland's paths and tracks, something which is not possible in a car." PC Henery is pictured on his new bike with Town Mayor Robin Ramsay and John Scott, Vice-Chairman of Darras Hall Estates Committee.